CanadaVet.com Blog: 10% off Revolution 6 & 12 Packs! 10% off Revolution 6 & 12 Packs! CanadaVet.com is having a fantastic fall sale. 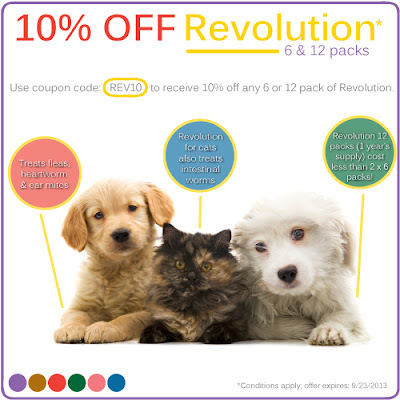 Get 10% off Revolution 6 & 12 packs; for cats and dogs! Enter the coupon code below to receive 10% off when you purchase Revolution 6 & 12 packs at CanadaVet.com. This fall sale ends on September 23rd, 2013. Buy Revolution today and save!